Nurses work long hours, deal with difficult patients, and their job gets messy. So why do so many men and women enter the profession? That question is answered in Nursing Is Caring, which highlights the experiences of Beverly Wheeler's former students at the University of Texas Health Science Center at San Antonio, Texas School of Nursing. The students were asked to write a short paper about a patient they had taken care of since entering nursing school who had inspired them and made them realize they were in the right profession. Their essays show that while people enter the profession for numerous reasons, they all want to care for people—and not just patients. Nurses play a critical role in helping families start the healing process. 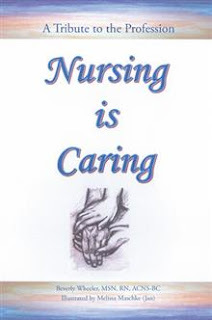 Whether it is holding a patient's hand, talking to a patient, or being a shoulder to cry on, nurses do much more than take blood or carry out a doctor's instructions. Whether you're thinking about becoming a nurse, questioning why you entered the field or simply seeking more information about the profession, you'll be inspired by the personal accounts in this tribute to the profession. Beverly Wheeler, MSN, RN, ACNS-BC, is a clinical assistant professor at the University of Texas Health Science Center at San Antonio, Texas School of Nursing. She was formerly a clinical nurse specialist at the National Naval Medical Center, Bethesda, Maryland, and an adjunct clinical instructor at Marymount University, Arlington, Virginia. She received her bachelor's and master's degrees from George Mason University, Fairfax, Virginia. Beverly is giving away a $25 Gift Card!